Anime-themed motivational-poster contest over at Riuva. Why not? I went to all the trouble of doing this in Illustrator before I discovered that Despair.com has an online generator. No biggie. …just not in English, and not this song. My new MacBook is not the ideal machine for running Apple’s Aperture application, but it’s supported, and with 2GB of RAM, usable. At least, it would be if Aperture didn’t crash every five minutes on a brand new install of version 1.5, while just poking around with the supplied sample project. Just for the record: I believe that my friend Hans Reiser did not commit murder, a crime he’s currently suspected of. I hope that his wife is found alive and well, and that their children are not forced to grow up without parents. 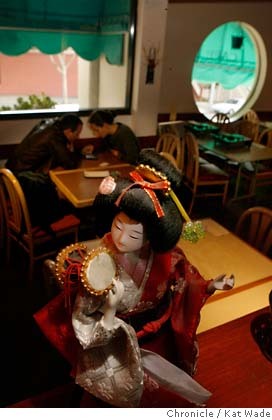 San Francisco is looking to invigorate its Japantown with an infusion of pop culture. I’ve been insisting for a while now that Otaku Tokyo is one of the few colorful themes left unlicensed for a major Las Vegas casino, so perhaps this will help show the money-men the power of kawaii. Given an old ClarisWorks 4 Japanese document and a working copy of ClarisWorks 4 Japanese Edition, in theory you can just export it to Word, and the Japanese text will be translated correctly. If you are running on an Intel-based Mac, this won’t work. Actually, unless you can do a clean reinstall of CW4JP under a copy of Classic that has the Japanese language kit installed, it might not work at all. AppleWorks 6, however, which is still available in stores and runs nicely under Rosetta, will. At least, with a little help. Open the file myoldstuff in AppleWorks. Don't worry if the kanji turns to garbage, and even if it looks okay, don't bother trying to cut-and-paste into other documents. It won't work. You can view and print, and that's about it. Save as RTF in, let's say, Desktop/myoldstuff.rtf. Open the file in Word, and save as a Word Document. Optionally, fix the fonts and margins, which are almost certainly wrong now. If your AppleWorks install is damaged or incomplete, it won’t be able to open CW4JP docs; you’ll have to reinstall. The English version bundled with PowerPC-based Macs for a long time works just fine, so if you’ve got one, you don’t need to buy the retail package. I use the copy that came with my PowerBook, which was automatically transferred to my new MacBook. Note that DataViz MacLinkPlus, for all its virtues, hasn’t the slightest idea what to do with Japanese editions of the software formats it supports. …because it’s stupid, that’s why. That’s my answer to OhGizmo’s question, “Why weren’t they designed like this in the first place?”. I can’t count the number of things wrong with this idea, although it’s refreshing to see that some of the commenters at Gizmodo gave it a shot. It appears that if you accept the default anti-phishing behavior, a record of every new website you visit is sent to Microsoft, omitting only the arguments passed to CGI scripts. "Sanitized for your protection," of course, but my, what a powerful market-research tool you've got there, Grandma. It finally supports transparency in PNG images, so the logo for my blog renders correctly for the first time. It still constructs phony italics for fonts that not only don't have them, but shouldn't (cf. the Japanese song titles in my sidebar). That stupid little print/view/save/molest toolbar no longer pops up on every image in your browser. Still no support for :hover styles in CSS. Now that habeas corpus and other basic rights, including the right not to be tortured while interrogated, have now been deemed unnecessary, more Americans than ever have been thinking of getting out the door while they still can. In my many years of interviewing sysadmin candidates, the most important qualification, and the hardest to explain in terms that make sense to HR, has been “do they think right?”. The core of it, I think, is the attitude with which they approach diagnosing and solving problems. Behavioral interviewing techniques can produce some useful information about problems they’ve dealt with in the past, but not so much on how they really got from X to Y. HR gets very nervous if you do anything that even looks like a direct test of an applicant’s abilities, so the best approach I’ve found is to swap problem-solving stories and pay close attention not only to the ones they choose to tell, but to the things they say about mine. I don’t care what, if any, degree you’ve got. I don’t care who you’ve worked for, who you know, what certification programs you’ve completed, or how precisely your last job matched our current requirements. If you think right, and you’re not a complete idiot, I can work with you. The two people who’ve been hired to replace the five of us are not complete idiots. One of them shows signs of thinking right. A company called Intego, whose business model is “scare people into buying our products”, announced today that they’ve created a proof-of-concept Bluetooth exploit that can crack your Mac wide open in seconds, without any user interaction. 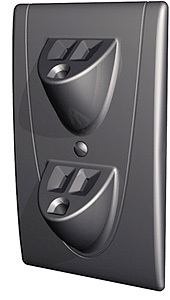 You’re vulnerable if you have Bluetooth turned on. …and haven’t installed any of the patches Apple has released since May. "If we want the world to embrace free software, we have to make it beautiful. I’m not talking about inner beauty, not elegance, not ideological purity... pure, unadulterated, raw, visceral, lustful, shallow, skin deep beauty. We have to make it gorgeous. We have to make it easy on the eye. We have to make it take your friend’s breath away." …John Kerry and Arnold J. Rimmer? 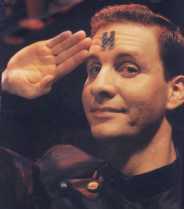 Based on the frantic spin surrounding today’s juicy soundbite, I’d say Rimmer was the likeable one. He also honestly admired the military, despite his failure to achieve the rank he felt he deserved. "Well, if you'll just bear with me, I think I've devised a fair and equitable system of choosing who should survive. It's based on age, rank, seniority, usefulness... to cut a long story short it's me. I was as stunned as you are, which is why I demanded a recount. But blow me! It didn't come out of me again!"